New Zealand has officially been declared as being in a drought. 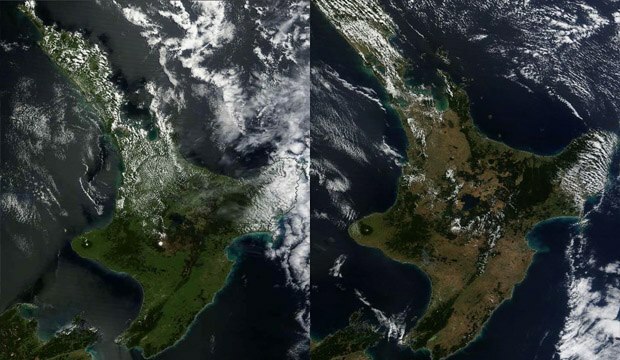 The above photo taken by satellite shows New Zealand in March 2012 (left) and again March 2013 (right). Most of the North Island has had no significant rain since well before Christmas. Cyclone Sandy is hopefully going to rain down on New Zealand over this weekend, but here on the east coast of the North Island forecast rain often fails to materialise. Even my drought tolerant plants are keeling over. My lawn is brown and patchy. The hills are brown. The fields are brown. Beneath the dried brown grass is dry dirt. Farm stock are being slaughtered because feed is so expensive. This means that meat prices will rise dramatically. Vegetable prices are going up because of the water costs to irrigate them and because so many crops are failing. Whoever would have thought we would be praying for a cyclone to head our way? I am a lurker when it comes to other people's blogs. I take a great interest and have many favourites and read every word and devour every picture. 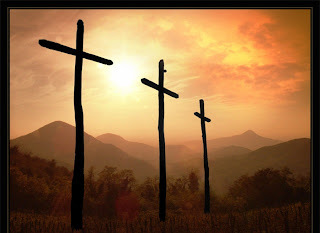 Sometimes, infrequently, I will even post a comment. One particular favourite blog, http://belleaukitchen.blogspot.co.nz/ has monthly random recipe challenges. While I am nowhere near confident enough to join in, because I blog as a hobby and don't feel I could possibly meet the standards, I do enjoy seeing what other food bloggers come up with to meet the challenge. Last months challenge was slightly different and involved taking photos of each blogger's cookbook collection. It was one I thought I might take part in - until I realised that my books are not confined to a collection. They are spread far and wide, nestled in amongst gardening and other reference books, and even fiction. So, with no time for rearranging, last month's challenge also got relegated to the Not This Month basket. However, going through each blogger's photos and reading the stories behind their collections and favourite books made me see my own books in a new light. Prior to moving house the first time, eighteen months ago, I must have had upward of 100 cookbooks. I did a lot of culling for that first move - books, ornaments, knick knacks, bedding, furniture - basically all the things that I looked hard at and decided were superfluous and taking up room. My cookbooks were just as ruthlessly culled. I have a terrible habit of writing in them. If I make a recipe I scribble a comment below it saying how it turned out, whether I would make it again and, if so, did anything need adjusting (i.e. temperature, cooking time, quantities etc). See? My system works. I have no memory whatsoever of making this, apparently, horrible cake, but my note tells me never to go there again: "Thoroughly horrible 0/10"
I culled my recipe books down to approximately 20. What then to do with the other 80 odd...? Who would want scribbled in recipe books? A few friends jumped at first offerings. I donated a lot of sundry items to the local hospice charity shop and asked them whether my "personalised" recipe books would be of any use to them, or whether they would end up sitting on the shelves and become a nuisance for them. They told me to bring 'em in and I did. A few weeks later, and with another bootload of items, I asked about the recipe books. The ladies laughed. They had all been snapped up by people who, once they realised there were handwritten comments in them, even began picking through all the cookbooks to find mine !! It gave me the warm fuzzies to think people actually liked having my graffitti-ed books. My old, handwritten recipe journal. Started when I was barely out of school and learning to cook in my first flat, along with another girl and a guy both also learning how to cook. We were all trying hard to prove that we could cook and none of us wanted to admit that we were learning on the job, even though each of us could clearly see we were all in the same boat. We had fun times in that flat - the accidentally melted out tupperware container when Karen tried to cook ginger crunch in the microwave...she lifted it out the microwave and the bottom of the container simply fell out. The frozen lamb chops which I put in a plastic bag and used Defrost on the microwave (which none of us were familiar with) and ended up cooking them on Defrost. They were the most tender, tasty lamb chops I ever remember having. We tried to replicate the happy mistake but never got the same great result. And Alex's amazingly light scones. He would make them randomly for us as a treat and we would huddle around the wire cooling rack and eat them hot with butter melting into them, and piled with jam and whipped cream. Heaven on a plate. He gave Karen and me the recipe, but ours never turned out like his - we always suspected that he deliberately left out some crucial step or ingredient, though he vehemently denied it. As happens with flatters, we eventually went our own ways - me overseas, Alex to university, and Karen settled down with her fella and started having babies. When I returned it was with a daughter of my own and the cookbooks came out of storage - including that journal. More recipes got added, and one day when I was about to write in it again my wee toddler came and put her hand over one of the inside pages and, on a whim, I traced around it. About five years later I looked at the tracing and called her over and I traced her hand again. And then again another five or so years later. I wouldn't, couldn't part with this journal. A lot of memories go hand in hand with the recipes in here - of wonderful meals and of the people who gave me these recipes. My, old now, edition carries an absolutely scrumptious winter comfort food recipe called Nun's Toast (which is in the "Cooking For Invalids" section. It is hardboiled eggs mixed into sauteed onions and then with the addition of a bit of milk and flour to make a white sauce, and seasoning. It is one of my all time favourite recipes, and I am still amazed that later editions have removed that recipe. My mother's even earlier edition of the Edmonds book is, literally, falling apart. I learnt to bake in her kitchen as a child using that book. And, as for Student Grub... well, I bought this for my daughter when she went flatting, but you wouldn't believe how many times I have used it as a fast reference to gauge how long something will take to cook. I am currently waiting for River Cottage Everyday to arrive. I managed to buy it online with free shipping from the UK for half the price I could buy it here in New Zealand (exchange rates factored in). I can't wait for it to arrive !! We finally had one of our fabled beautiful Bay days - stunningly sunny and not a breath of wind, and for once I wasn't working. I managed three loads of washing onto the line, and sprayed the troublesome jasmine again. The forecast is for rain again this evening and lasting through tomorrow. I am, of course, back at work the day after that so I imagine the weather should clear up again at that point. I rang the regional council again about the enormous privet in the neighbouring garden that overhangs our fenceline almost to our roof guttering. That house has been empty for the ten months we have been living here as it has not sold and the owner is not keen to rent it out after his previous bad experience. I've never met him as he lives out of town and I don't even know his name - hence my call to the council. Privet, while a very attractive tree, is a banned tree in New Zealand because of the high incidence of hayfever and exacerbation of asthma requiring hospitalisation that it causes. The tree has gone through its beautiful but asthma-inducing flowering stage and is now covered with seed-bearing berries. Once they fall or are taken away by birds there will be countless new privets germinating and the cycle continues. The jasmine has also apparently spread on the other side of the fence and is gaining a good hold judging by the way it is climbing up the privet. With no one living there to keep it in check the jasmine has gone feral. As often happens when dealing with government departments I got an answerphone. I left my name and number and very nicely explained the situation again (I think this is my third phone call and in the last one six months months ago at least I was told the tree would be gone within three months). I don't think I'm hounding them. Three phone calls in ten months? When I have had to use my inhaler every single day as opposed to my usual usage which is only when I have a cold? We don't have air conditioning so our choice is to wilt from heat exhaustion with closed windows, or sneeze and cough and wheeze our way through the day with the windows open. On a brighter note, my daughter and I have been invited to our neighbour's home for dinner. So lovely not to have to think what to have for dinner and to not have to cook. Finally a stunningly beautiful day and I slept through most of it following my night shifts. Such is life. Hopefully the fine weather will continue and I can catch up on some gardening and the mountain of washing which has accumulated. These photos were taken a few months ago at one of my favourite garden nurseries. It is such an informal tiny nursery in the yard of the house where the owners live, but it has such a fun vibe. Old claw foot baths are now so popular that they are well out of my price range. But I do like them in a garden setting. I'm toying with planting ornamental grasses for their low maintenance value. This pony tail palm must be very old. You don't get a true sense of how big it is in this photo, but let me assure you it was BIG. I had one that was growing very nicely until the cats discovered its teeth-flossing benefits. After that it never stood a chance. I like them indoors, with their gracefully flowing fronds. I'm rather taken with this. I have no idea where I'd put one though. Must work on it. Are they Security, do you think? They look fierce enough! I like the way the pumice has had a hole chiselled through the centre. Seeing another plant through it gives it a whole new dimension. We have pumice a-plenty lying on the beaches here, so this would be easy to copy, perhaps when I am stuck for a gift idea. This colours did look a lot nicer in person. The photo makes it look very drab. This was at a different garden centre and made me a bit sad, I have to say. Sending warmest wishes to you and your family from mine. "Oops, I did it again..." as the song goes. We got suckered into taking another kitten, the last one left in a litter and no one wanted her because she was the plainest. What else could we do? She is four months old now, and is the second most cuddly, snuggly kitten in the world. (Delphi retains the number one spot - no contest really). Oddly, it feels as though our household has rounded out again. Old Sophie was always the odd one out - grey tabby among the three black cats. When she died (nearly a year ago now) we thought three was a nice number and yet when Irish came to live with us - an orange tabby - somehow everything just felt balanced again. I can't really describe it better than that. She has settled in beautifully with the other animals. She has had outside access for a month now and is very clean. She is just starting to venture further afield (always a worrying time with kittens) so today I have bought her a collar to let all the people she comes into contact with know that she is loved and not a stray. Now I just need to wait for her to come in so I can put it on her!